Recently, 425Business Magazine visited TimeXtender’s HQ in Bellevue, Washington, in order to profile our working culture for its Office Envy series. The resulting feature documents how mindful business practices can keep you balanced, even in a busy global workplace. To get a glimpse of what a mindful but busy workplace look like, to see how we recharge and to find out more about the benefits and ROI of mindful and purpose-driven ways in business, you can read the online version here. We love having guests in our offices and it’s fun to see their reactions to the busy calmness, our mindful ways and the physical artifacts that reflect our business DNA and culture. Our guests frequently remark that they feel they have walked in on a very different, unique and peaceful (yet busy) work environment. They are also curious about our meeting guidelines and other DNA artifacts that are placed in all meeting rooms and are essential to all meetings, both internal and external. Overall, our meeting guidelines support ‘The Habits of Highly Effective People’ process, our core beliefs and our mindful ways in business. One of the most interesting things to our guests is the silence, as we always start each meeting with a moment of silence to land, focus and connect. When we invite them to spend one minute in complete silence, most people are excited and some even feel nervous. Silence at work can feel awkward because we are so used to ‘doing’. How often do you sit in silence during a working day? Whenever most of us have a quite moment, we tend to grab our smartphone to check emails, news or social media. A minute of silence with ourselves and together has many benefits, for our well-being, for our focus, for the outcome of the meeting and for the connection between people. A moment of silence can completely change the chemistry of a meeting. By pausing, we are all letting go of the day’s stresses – the hectic morning with kids or our spouse, the heavy traffic on the way to the office (something that really pushes our emotional buttons), the phone calls that need to be made, the long to-do list and so on. Quiet time together helps us to connect and build trust subconsciously. You can really feel it, even when you are trying it for the first time. After a moment of silence, we start each meeting with increased trust, focus, calmness and clarity. It’s a small investment with a huge effect. That’s why many first-timers come to us afterward to express the impact that one minute has had on them. People have asked us if they can use our guidelines as an inspiration to their own meetings. YES! Of course you can. Give yourself the gift of trying it in your next meeting. 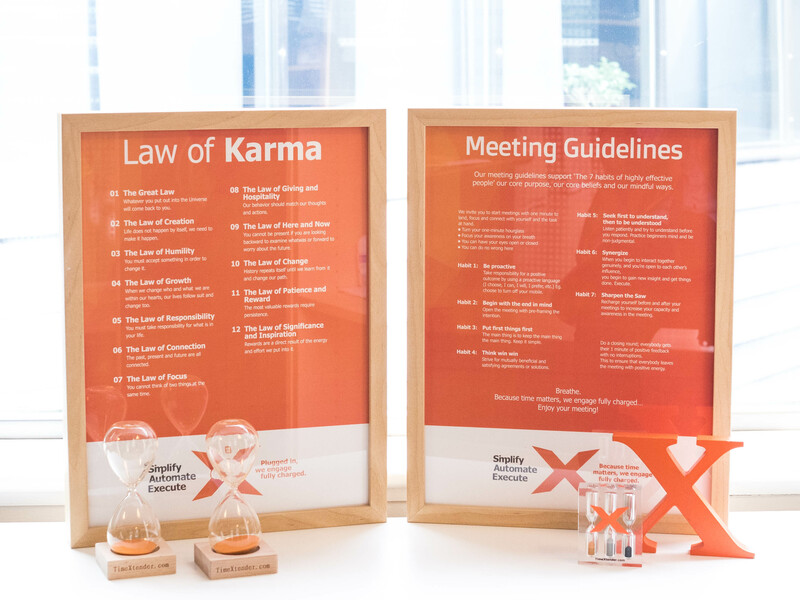 We would be happy and grateful if our guidelines can inspire you all to have more effective, connected and mindful meetings. Read: Mindfulness - What's in it for you? If you are interested in a PDF copy of them, please send us an email at hello@timextender.com. And please also feel free to share your experiences and ideas with us. What makes the biggest difference in your meetings? Tell us in the comments section below this post.